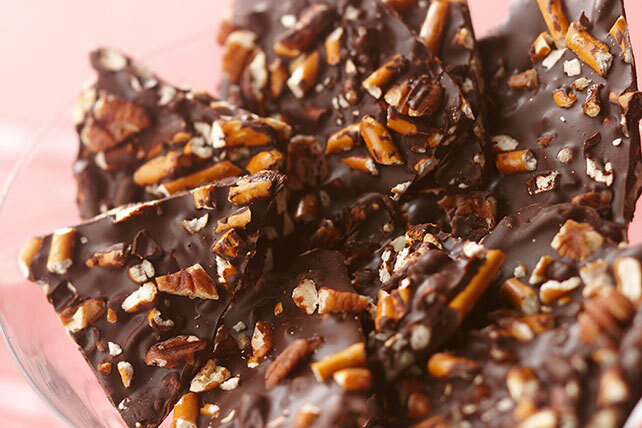 If chocolate-covered pretzels are popular among your family and friends, this pretzel bark with pecans will knock their socks off. Stir pretzels and nuts into chocolate; spread onto waxed paper-covered baking sheet. Omit nuts and pretzels. Melt chocolate and spread onto prepared baking sheet as directed. Immediately drop 1/4 cup creamy peanut butter, by spoonfuls, onto chocolate. Cut through peanut butter with knife several times for marble effect. Refrigerate and break into pieces as directed. Prepare using BAKER'S Bittersweet Chocolate or BAKER'S GERMAN'S Sweet Chocolate, and/or substituting PLANTERS Lightly Salted COCKTAIL Peanuts or BAKER'S ANGEL FLAKE Coconut for the pecans.